"It is a travel book." "No, it is a book about living." 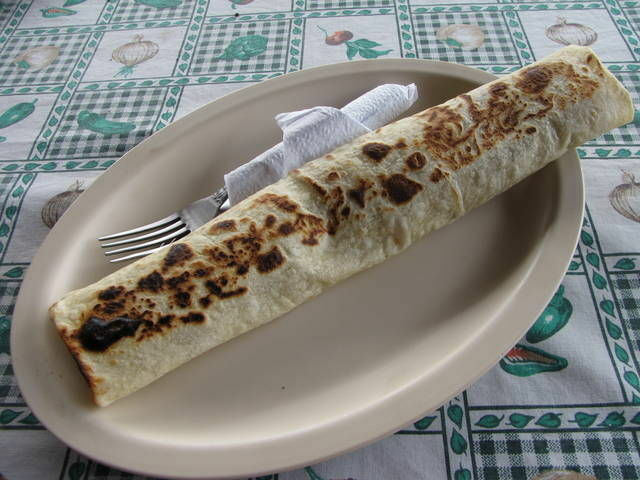 I moved from Panajachel, Guatemala to San Pedro with one major goal, to be able to eat this Beef Burrito for 22 Quetzals daily at the Burrito Factory. I love my life, I love how I live. I thought Blogging was cathartic, able to elicit epiphanies on demand, well writing a book is "epiphany machine." When writing a book, I am forced to tie together all these thoughts and explain or relate them, when I Blog, I can have a start, middle and end, and they do not have to gel, they do not need to be enmeshed, no need for congruency, I can be normal human. I love that I can sit here and muse for hours, weeks, or days, I have escaped the USA culture, there is no social pressure pushing me to buy a car. I can live in locations and situations that do not need to conform. I can move across a lake just to eat Burritos. However, the true benefit is when I am forced to find something to do everyday, because I have no, "I need to do this." I am free to explore, and even more important, I can work on projects that are fun, and a trivial benefit, I make more money that insure I never leave paradise. I am more than happy to explain how to go live in places all over the world for months on end wonderful apartments on the edge of lakes, with views of Volcanoes. I am not that excited to explain to you how to traipse across Africa or South America where I know many of you will be robbed and have an "ordeal" as my friend Robin from GadTramp.com says. "I get embarrassed explaining some of my rooms, for one, they are off theme, I keep telling people I am Hobo, but I live in Luxury, this just is going to throw up red flags. But even worst, I feel as if I am bragging, my Mother does not want me to rub this into peoples faces." "I living in Paradise in a Hobo Budget." The bottom line, I work less than retired people do, I do only want I like to do, and I thrive and prosper, the world is my playground. I travel across countries for enjoyable challenges, but if I want to, I can live in Paradise and Luxury, but just renting rooms by the month. It is moving that makes this confusing, travel is chaos and I like that, but I cannot get passionate about telling people to follow me, it is not for everyone, but this living in Paradise by the month is for the people smart enough to understand, there are rooms on planet earth for 2-8 dollars per day. When I explain these rooms, the reader assumes I am lying, go figure, well, that is ok, some of know, there are tens of thousands people living outside the same as me, and some need to stay inside the box. I love it outside the box.